A surprisingly scenic stretch with great wildlife and geology surrounded by an urban environment, catch the Eau Claire at a high water level and awesome 2’-tall standing waves form for what may well be the most perfect after-work (or happy hour) paddle of all time. ~12′ per mile first 1/2 mile. ~3 feet per mile thereafter (steeper in the rapids on the Eau Claire section). Gauge Note: There is no gauge for the Eau Claire River. The best proxy is the Black River in Neillsville. Bear in mind that the Black River is bigger and drains a much larger area. Referring to the gauge will give you a good idea at least of current levels, high or low. You should be able to visually gauge the river from any of the bridges downtown where there are rapids, Dewey Street in particular. Though we recommend this level, this was unusually high but the river can still be run at lower levels, too (though the rapids won’t be as fun). Do note that the Eau Claire does run quite shallow in summertime. Time: Put in at 4:30p. Out at 6:00p. Wildlife: Great blue herons, bald eagles, carp, muskrats and a snapping turtle. Chalk this trip up to “the best laid plans of mice and men.” Originally, the idea was to have a 4-day holiday weekend up in the Eau Claire area. Fortunately or unfortunately, ongoing rain put the kibosh to that (that rain did however spike up all the water levels, which was awesome timing). My friends and I decided to wait until Saturday to drive up instead. Uncertain whether we’d even get a trip in that first day, we took a wait-and-see approach as for the skies were concerned. Much to our good luck, by mid-afternoon the clouds parted, and the sun was beaming (true, that window would close soon and we would receive a light drizzle by the time we were on the Chippewa, but that was nothing next to thunder, lightning, or a downpour – none of which happened I’m happy to say). So, to keep the trip simple and neat (like any good cocktail) but still have time on the water, we selected the final clip of the Eau Claire River, since we were so close to it anyway, it’s a short trip, and the conditions for it were fan-freaking-tastic! This trip rocked! Sure, some of it had to do with the weather working out, being on a new river (for us) in a cool little city, etc. But this really is a fun and beautiful trip, irrespective of our own circumstances. First, the rapids. This trip starts on a bang and never really whimpers (although there are plenty quietwater sections). If you’re a strong, confident paddler with adequate skills, you could plunge right into the frothy maw of the 3-4’ tall standing waves below the dam. Or you can catch the tail end of those rapids that will simply continue for at least 100 yards, a heluva fun way to begin a trip. While you’ll want to pay attention to the rapids, the surrounding scenery is quite pretty as well. Both sides of the river are lined with modest rock outcrops, predominantly sandstone (the city of Eau Claire sits rather near the edge of the Driftless periphery). You’ll be able to catch your breath and crack open a beverage by the huge and modern Highway 53 bridge (where also there’s an alternative access). While the swift current will subside – momentarily – the river scenery remains picturesque with tall banks lined with pines and birch, rock outcrops here and there, wildflowers, etc. That you’re surrounded by an urban center is totally counterintuitive. This will change in another mile or so, as you enter Eau Claire proper. Buildings will replace the tall hills and trees, and you’ll pass under one bridge after another. It has a cool feeling entering the city. That and, watch out, the rapids kick it into high gear again beginning at the railroad bridge. Well, for most folks. The Eau Claire is hardly a whitewater river for true whitewater paddlers. But for light whitewater enthusiasts such as ourselves, the final mile or so of the Eau Claire River is just a jubilant blast, especially when the water is high. For a couple hundred yards you’ll ride a baby bronco of 2’-tall standing waves one after another, up and down, sometimes splatting the water down with your bow, other times getting slapped by a wave. It’s nothing you’ll pee your pants over, but you’ll have several laps of water instead (which is much preferable anyway). This section was just so much fun, and we all had grins and smiles from ear to ear. Not since the Pine River in Lincoln County have I had so much fun on a continuous run of standing wave rapids. Now you’re truly in the belly of Eau Claire (the city). While the river is quite wide, the surroundings are still attractive and interesting. Rapids will continue, I’m happy to report. Some just piddly riffles, some honest-to-goodness Class I+ standing waves (again, at least in higher water conditions) – all just a couple extra sprinkles and topped cherries on this utterly delightful trip. There’s even a tiny feeder stream called Niagara Creek that comes into the Chippewa on river-left, falling over a small ledge. Together with another prominent sandstone bluff (also on the left), the mix or urban and natural setting is quite striking. The takeout, unlike the put-in, is easy to find and access. Parking is plentiful and close to the water. It’s upstream of the attractive truss bridge, on the right along a great bike trail. Now that you’re in downtown Eau Claire, go do something fun! We cannot recommend strongly enough Stella Blues for incredible Cajun food and good beer. Also, it should be pointed out that the Chippewa River Trail runs parallel the river for several miles and connects with a couple other trails. We didn’t avail ourselves of this, since we had two cars, but I’ve pedaled the trail in the past and it’s truly wonderful. I don’t know why, but finding the dam at Lake Altoona was far more complicated than it should have been. Once there, get prepared for some minor inconveniences. First, a 500’-walk to the water with your boat and gear, as the dirt road is locked off (in fact, this was the case with every Eau Claire River trip we did this weekend). As you walk closer to the water, the path becomes pretty steep and stubbly with loose rocks. It’s not really that hard, especially with a companion but it’s something to take into consideration. It’s not for the unsure-footed either but it has a wild-feeling aesthetic to it. Launching from this spot, below the dam, can be a bit tricky too as the discharge from the dam produces a pretty furious froth of Class II-III rapids, creating constant little waves crashing on the shore. Prepare to be a little wet. Seriously though, you’re probably going to get wet on this trip anyway, eventually. Just be careful that you don’t get bounced into rocks (tragically, the rapids below the dam have taken at least one paddler’s life, so do be careful here). Alternatively, you could put-in at the Highway 53 bridge, northbound lane, on the upstream side of the bridge on river-left. There’s a brand new launch/recreational area there. However, this means skipping a really fun stretch of immediate rapids as well as some of the pretty rock formations. We would definitely do this again, in a heartbeat. The only thing we’d do differently perhaps is continue a little longer on the Chippewa by taking out further downstream. And maybe do this in early spring or late fall to better appreciate the hills and rock outcrops with their leafy camouflage. But if all you have is time for a super-fun 5-mile trip, then let it be this! 5.5 miles. A fairly long and complicated set of turns for such a short paddle trip, and one not suited for bicyclists due to the absence of shoulders on the roads (it would turn out to be the first of several missed turns and wrong roads of the weekend). Long, steep trail from the parking area to the put-in below the dam. Worth the effort of schlepping to this pretty put-in. 3-4′ standing waves right below the dam. Much gentler (but still fun) rapids follow downstream from the dam. Such a fun way to start a trip. The first set of the Highway 53 bridges. Lots of sandstone rock outcrops on this trip. It’s easy to forget you’re surrounded by a city. We were very grateful for a couple hits of sunshine. Lots of bridges in this 5-mile trip. Cool wave formation on eroded banks. More glorious sandstone secrets in an urban setting. Getting riffly again upon the approach of a UW-Eau Claire pedestrian bridge. The rapids kick it in again by the railroad bridge. The only way forth is through. We all got wonderfully wet in this section. The last segment of rapids on the Eau Claire before things subdue near the confluence. Looking upstream at the confluence – Chippewa on the left, Eau Claire on the right. Handsome bridge on the Chippewa in downtown Eau Claire. The littler waterfall ledge of Niagara Creek – again, this is downtown Eau Claire. 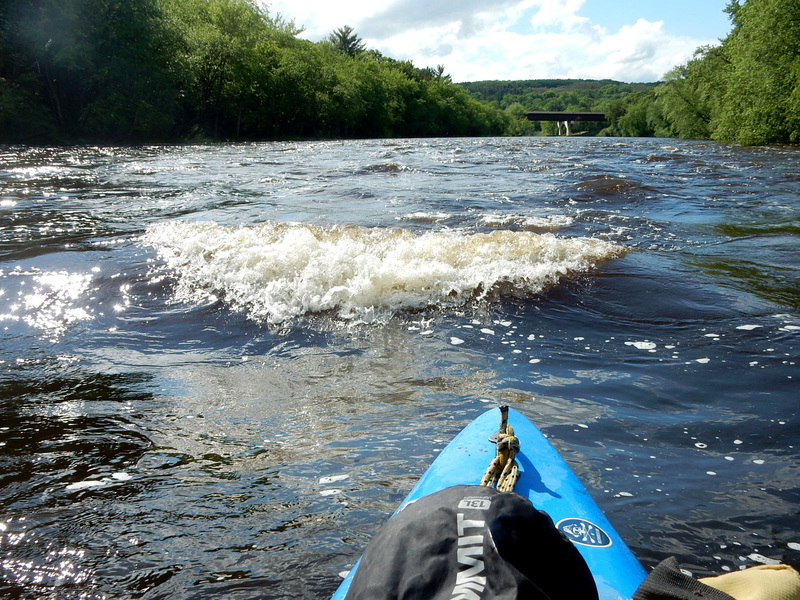 Easy (but fun) rapids on the Chippewa past a gorgeous sandstone rock outcrop. Choppy water in the rain. Attractive truss bridge downstream from the takeout. The easy-peasy takeout at Hobbs Landing. The Chippewa River Trail runs parallel the river for miles.